I was cleaning out my computer over the weekend...dreaded task, right? 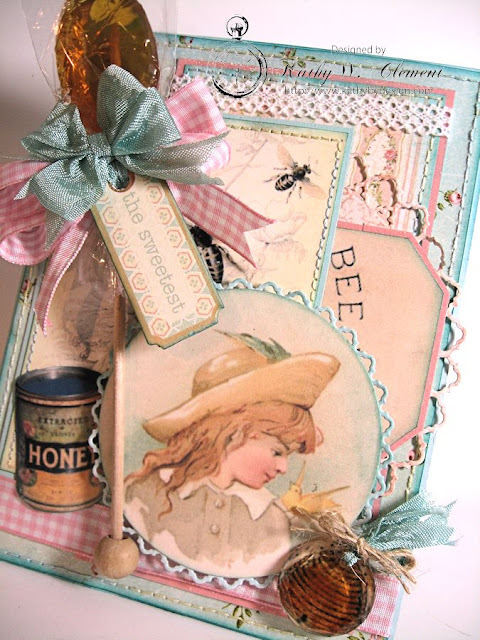 But I found some really cool public domain bee images that I had downloaded somewhere along the line, and realized that if I grouped them together they would make a lovely summer card that I'd like to share with you here today. 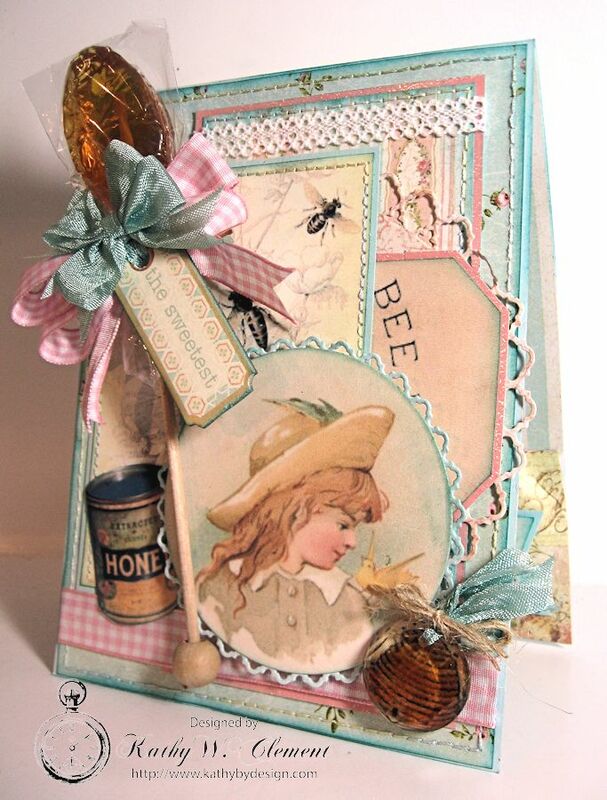 The image of the little girl was originally part of a vintage clothing ad for a company called Bee Hive. You know how much I love vintage images....and this one is really bee-utiful. I also love the new Paulette Crocheted Lace. It's very fine and silky in texture, and it looks great on top of my background panel. I cut out the bee hive from the ad, colored it in with a marker, then adhered it to a crystal charm with some Glossy accents. I die cut the girl using Spellbinders Diamond Essence Dies, and then layered everything up with Graphic 45's refreshed version of Baby to Bride. 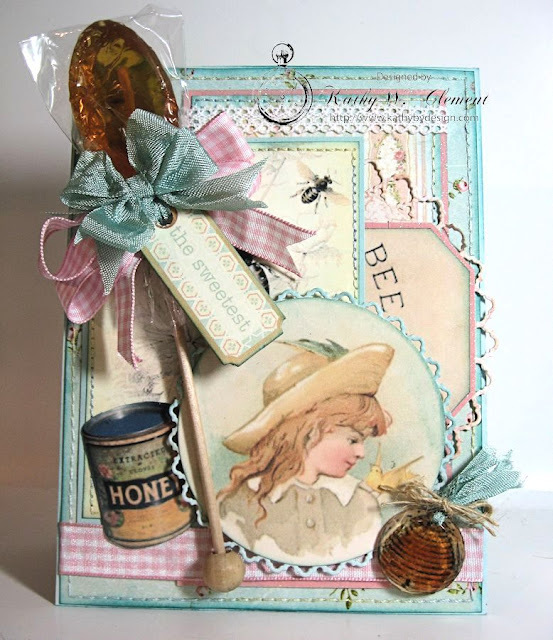 The colors are perfect for this summery card. I found the perfect ribbon pairing in this luxurious Bay Leaf seam binding and summery pastel Light Pink Plaid Ribbon. Just a touch of natural burlap string on my bee hive charm holds the seam binding in place. The honey spoon was added with hot glue and the bow was tied with my Zutter Bow-it-All Tool, of course. I thought about adding flowers, but I really liked the sweet simplicity of the card. What do you think? 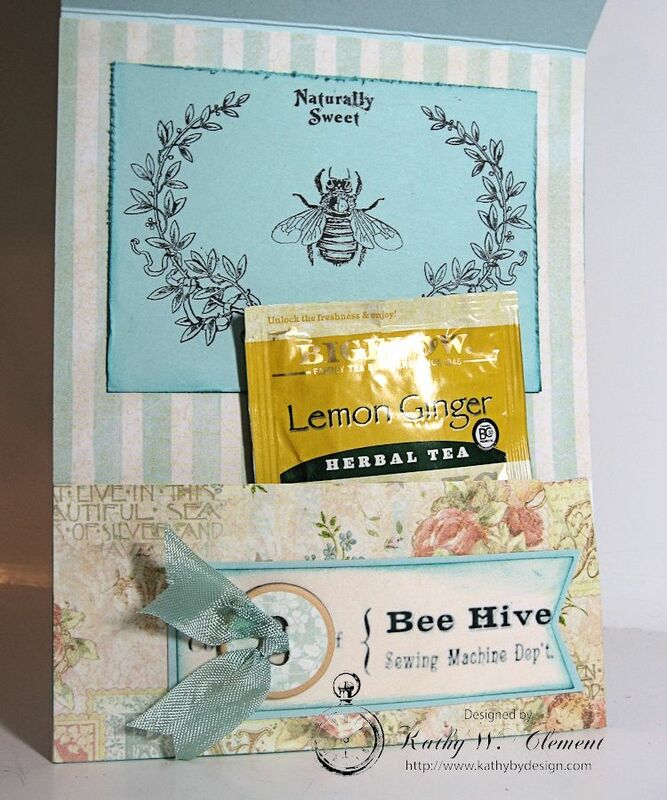 I created a little pocket on the inside of the card, then tucked a tea bag in there...to go with the honey spoon, naturally! The stamped images are Crafty Secrets Queen Bee. The card could be used for just about any occasion, but would make a great Get Well Card. Hi Kathy I love your vintage card that you got off the internet, please share the sight so we can all get them they are truly loving what beautiful pastels ! that vintage look if just amazing.